December’s NFP report was a miss, but the Greenback got bid higher. What’s up with that? Well, here’s a review of December’s employment situation to help you out. Well, the leading indicators and economists were apparently all wrong, since non-farm payrolls increased by 156K in December, which is much lower than November’s +204K reading. But on a more optimistic note, December’s reading is still above the 100K “floor” and November’s reading got revised higher from 178K to 204K to boot. However, October’s reading was further downgraded from 142K to 135K (161K originally). Still, the revisions mean that the U.S. economy generated 19K more jobs than originally estimated. And that’s a good thing. As for the usual breakdown, job creation in the service sector slowed down, which is the main reason why the reading for non-farm payrolls in December was lower. Also the service sector was originally estimated to have generated 139.4K jobs in November. This was revised higher to 185.1K and is the reason why the reading for November’s non-farm payrolls improved. 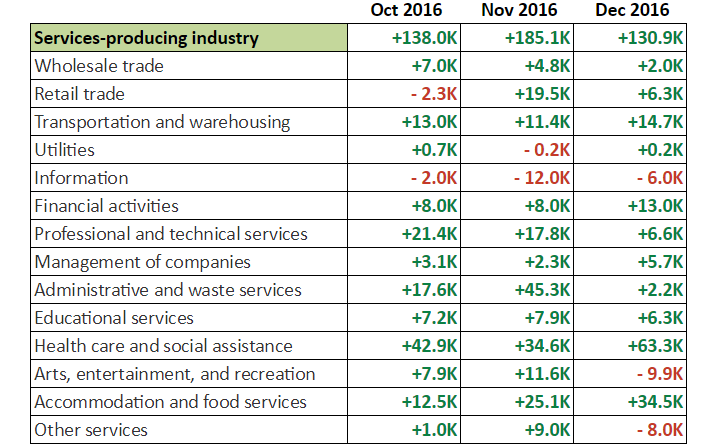 The main contributors to November’s upward revision are retail trade (+19.5K vs. -8.3K originally), administrative and waste services (+45.3K vs. +37.7K originally), and accommodation and food services (+25.1K vs. +18.8K originally). This means that more gasoline station attendants, cashiers, janitors, bartenders, waitresses, and professional McDonald’s burger flippers were hired in November than originally thought. Manufacturing, meanwhile, finally saw a net increase in jobs after four consecutive months of job shedding. Even better, the increase came mainly from the higher-paying durable goods manufacturing sector. The 12K increase in government jobs during the December period also helped keep jobs growth above the 100K “floor”. 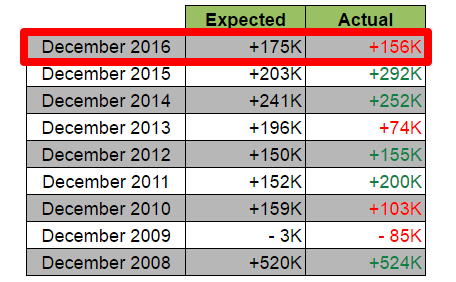 Interestingly enough, the number of government jobs generated in November was revised significantly lower to 6K. 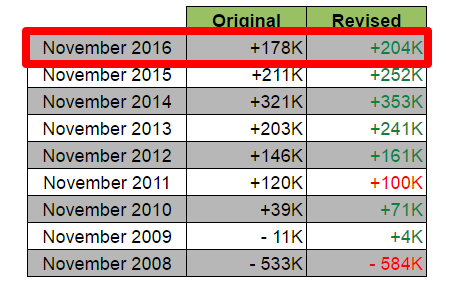 It originally printed a 22K increase, so the downgrade partially offset the upward revisions from the service sector. After November’s disappointing 0.1% contraction, economists forecasted that average hourly earnings would rise by 0.3% in December. Well, wages grew by 0.4% ($0.10) month-on-month to $26.00 instead, beating market expectations. Year-on-year, this translates to a 2.9% increase, accelerating from November’s 2.5% and is the best reading since 2009 to boot. Sifting through the details of the NFP report, the acceleration in wage growth was pretty broad-based, with only the financial services industry reporting a contraction in earnings. As expected, the jobless rate deteriorated from 4.6%, a low not seen since August 2007, to 4.7%. However, the higher jobless rate was widely expected and also happens to be in line with the Fed’s own projections. In addition, the higher jobless rate was due to the labor force increasing from 159,456K to 159,640K, as the participation rate ticked higher from November’s downwardly revised 62.6% reading (originally 62.7%) to 62.7%. Still, the number of unemployed people increased from 7,409K to 7,529K, so the U.S. economy was apparently unable to absorb the influx of peopled who joined or rejoined the labor force. Also, despite the higher participation rate, the number of working-age people who are not in the labor force rose by 18K, reaching a new record high of 95,102K. Overall, the December NFP report was actually mixed, since non-farm payrolls was a significant miss while wage growth beat expectations. And while the jobless rate deteriorated, the uptick was widely expected and due to the higher participation rate. But as I noted in my Forex Preview for the December NFP report, a downside surprise for non-farm payrolls usually results in a quick Greenback selling spree, and that’s how forex traders initially reacted to the NFP report. However, I also mentioned that follow-through selling is generally unlikely, as long as the reading is above the 100K “floor” but that also depends on how other labor indicators fare, with wage growth in focus. And that’s exactly what happened, given that December’s reading, despite being a miss, is still above 100K. Wages, meanwhile, grew at a faster-than-expected pace. As such, more buyers were enticed to jump in. 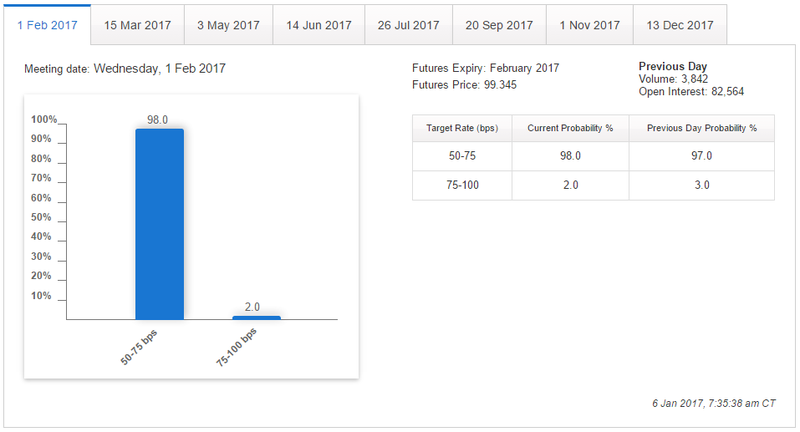 In terms of rate hike expectations, the CME Group’s FedWatchTool showed that the probability for a follow-up rate hike during the February FOMC meeting fell from 3% to 2% around five minutes after the NFP report was released. Although the probability of a February rate hike later climbed back to 3% later on. Meanwhile, rate hike probabilities for the other months improved, although the probability of a rate hike still didn’t go over 50% until the June FOMC meeting. 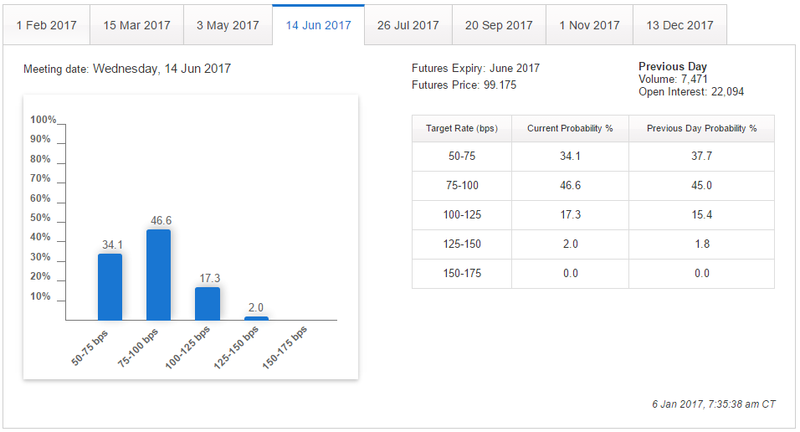 Speaking of the June FOMC meeting, the probability of a June rate hike increased from 62.3% to 65.9%. By the way, if you have no idea how to read the CME Group’s FedWatch Tool, or have no idea what it’s all about, you can check out my quick primer about it here. How about you? Do think the Fed is still on track for 2-3 rate hikes this year? Share your thoughts by answering the poll below!